Page revised in June 2016. Links to this page can be found in Book 9, Map B2, Day 1 and Day 4, View C7, and Rione Pigna. In 1754 Giuseppe Vasi showed this square in a plate covering Palazzo Pamphilj. In that plate the square was empty apart from a luxury carriage. 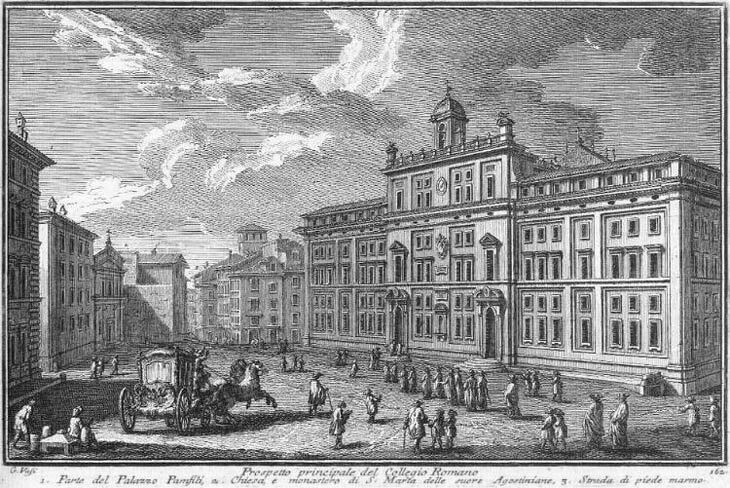 In 1759, when he depicted Collegio Romano, which housed the largest public school of Rome, he showed a procession of pupils heading towards the entrance; they wore tricornes which were very popular at the time, because they provided protection from the weather, sun and rain. 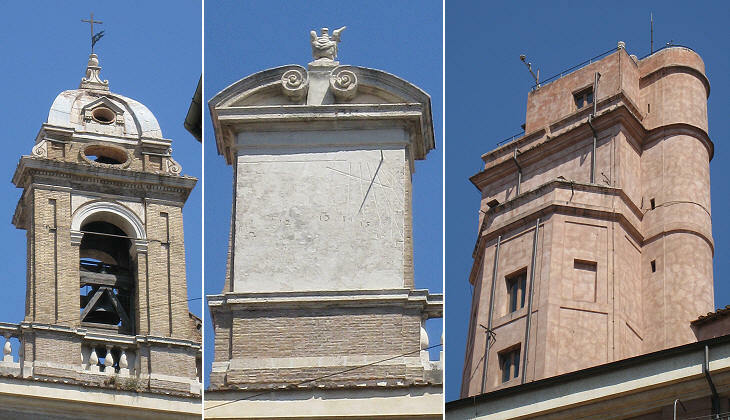 In the plate Vasi showed the tip of the façade of S. Ignazio, a large church behind Collegio Romano; the tip of the façade cannot be seen from this square, but perhaps Vasi's aim was to highlight that the church did not have a dome. The view is taken from the green dot in the 1748 map below. 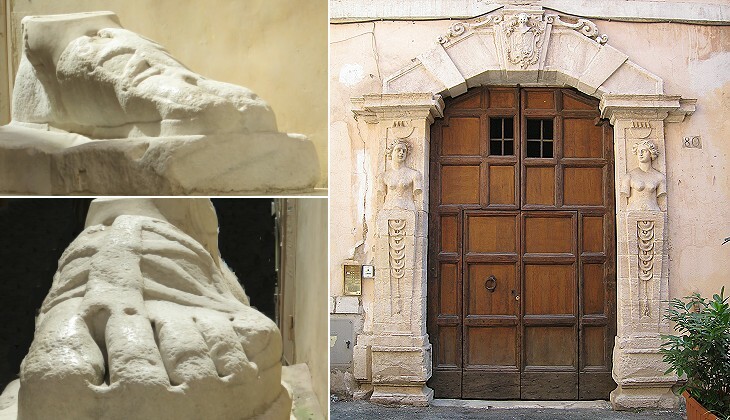 In the description below the plate Vasi made reference to: 1) Part of Palazzo Pamphilj; 2) S. Marta; 3) Street leading to Piè di Marmo (and S. Maria sopra Minerva). 1) is shown in another page. The map shows also 4) Collegio Romano; 5) S. Stefano del Cacco; 6) Palazzo Frangipane. The only change to the square, apart from the too many parked cars, is the enlargement of the street leading to Piè di Marmo; in 1852 part of the Augustinian nunnery adjoining S. Marta was pulled down and replaced by a smaller building designed by Luigi Poletti. The Counter-Reformation effort needed support from a theological/cultural viewpoint and the Society of Jesus, the order founded by St. Ignatius of Loyola, provided it through a series of educational institutions in all Catholic countries. 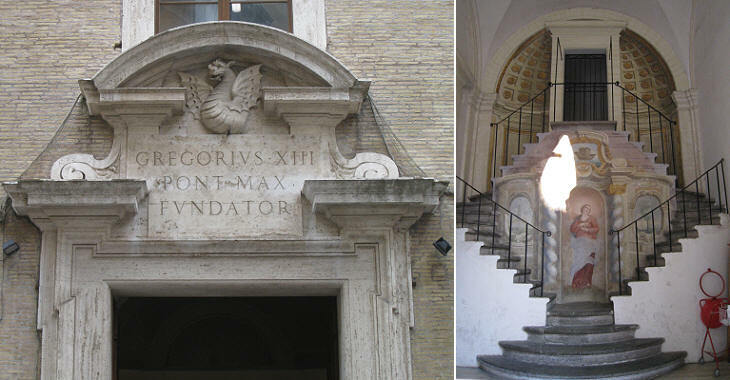 In Rome the Jesuit schools were housed in Collegio Romano, a large building, the construction of which was promoted and completed by Pope Gregory XIII in 1582-583. 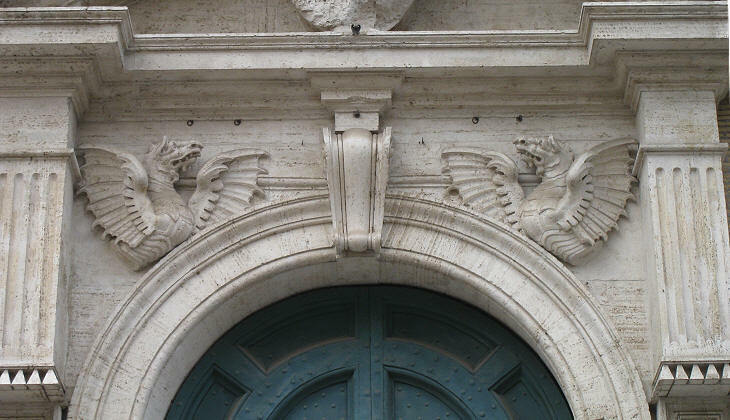 The heraldic symbol of the Pope was a dragon and this explains why dragons were placed in so many parts of the building. 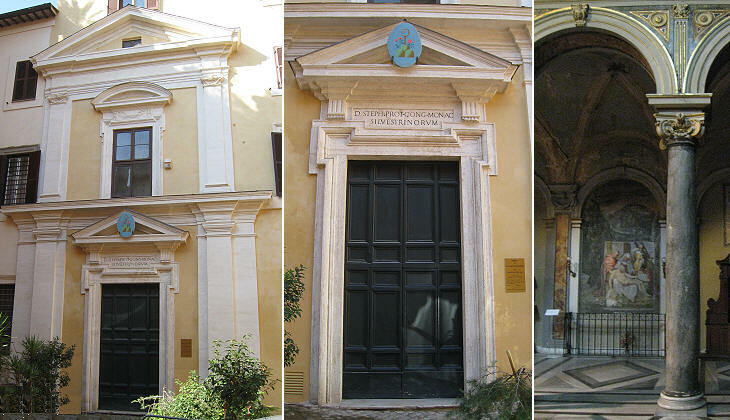 Many future popes and cardinals studied here, but the schools were not reserved only to those who embraced the ecclesiastical career. 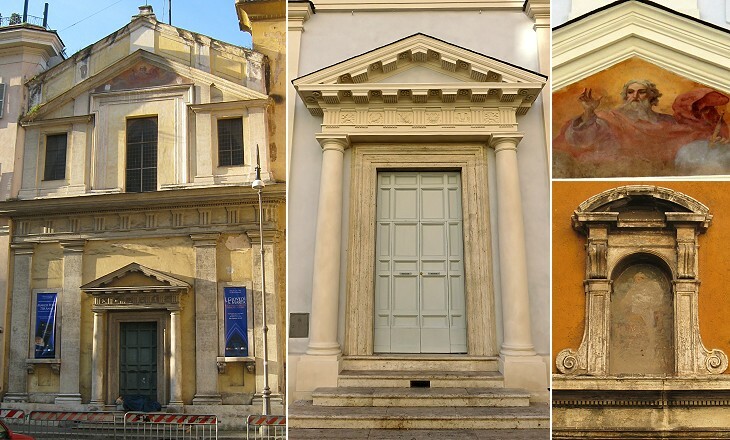 For some time the design of Collegio Romano was attributed to Bartolomeo Ammannati, but it is now generally believed that the building was designed by Giuseppe Valeriani, a Jesuit brother. Whoever the architect, he had to deal with the unusual shape of the area chosen for the building (a trapezium); of the two portals, only one was actually needed (it leads to the large courtyard around which the palace is structured); the other one had only an aesthetic purpose. Pope Gregory XIII is known for the reformation of the calendar which established that the years at the end of the centuries are leap-years only if they can be divided by 4. So the year 20(00) was a leap-year, but the year 19(00) was not a leap-year. The commission which recommended the adoption of the new calendar was headed by Christopher Clavius, a Jesuit professor of astronomy and mathematics at Collegio Romano. 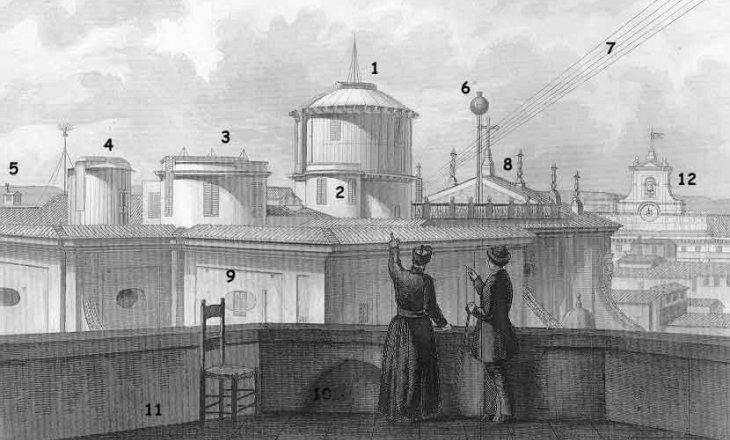 In 1787 a turret was built on the roof of the building to serve as the astronomical observatory, but in 1852 for stability reasons the observatory was placed exactly above the missing dome of S. Ignazio (you may wish to see it in another window). 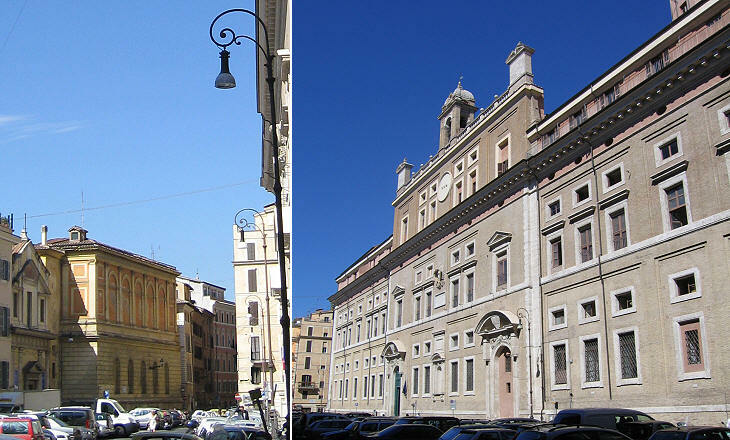 After the 1870 conquest of Rome by the Kingdom of Italy, the building was confiscated and in 1871 Liceo Ennio Quirino Visconti, one of the best state-funded high schools of Rome, was established in its premises. The choice to dedicate the school to Ennio Quirino Visconti was not without political significance. Visconti (1751-1818), a former student of Collegio Romano, was an antiquarian and art historian. He wrote a most comprehensive catalogue of the ancient works of art at the Vatican Museums and he was the curator of Musei Capitolini. In 1798 the French appointed him one of the five consuls who formed the government of the Roman Republic. At the end of 1799 Rome was occupied by Neapolitan troops and Visconti fled to Paris, where he held important positions at the Louvre, was appointed Chevalier of the Légion d'honneur and where he remained until his death. 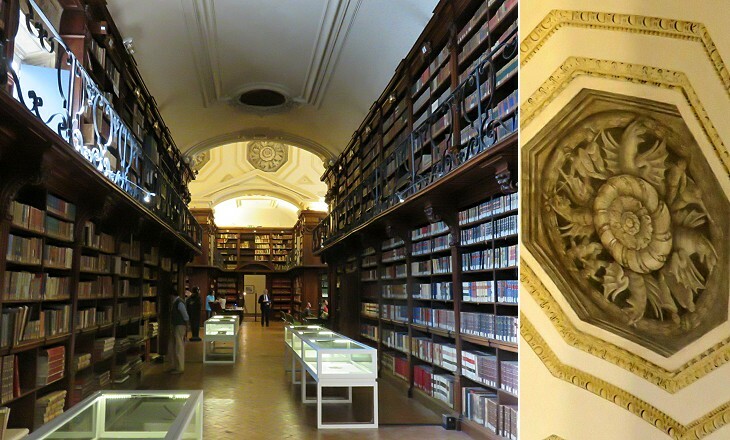 Collegio Romano had a library of some 50,000 volumes which in 1876 were moved to the National Central Library. Today its premises house the Ministry of Cultural Heritage and Activities and Tourism which has a library of Archaeology and History of Art. 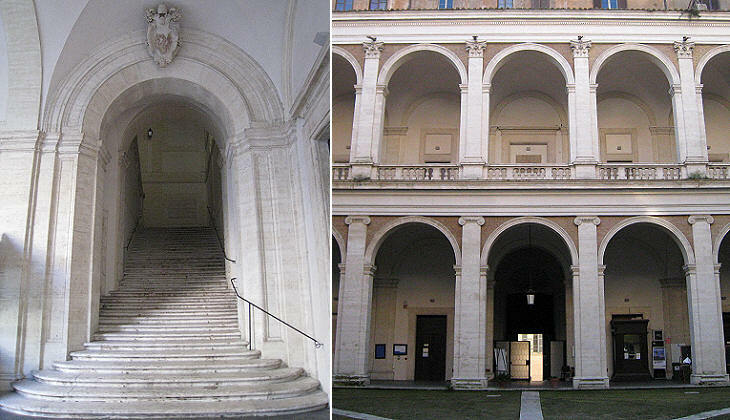 In 1927-930 the Holy See built Pontificia Università Gregoriana which is the heir of Collegio Romano from a religious viewpoint because the majority of the professors are of the Jesuit order (it is situated a short distance from Collegio Romano). Athanasius Kircher (1602-680) was a Jesuit brother who had a wide range of interests and wrote some forty treatises on a variety of subjects, including the (erroneous) decipherment of the hieroglyphs of Domitian's obelisk at Fontana dei Quattro Fiumi. 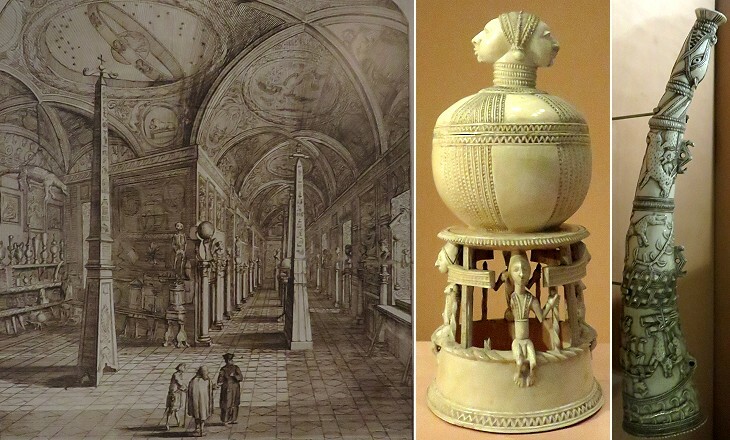 He gathered an unusual collection of "curiosities" at Collegio Romano which reflected his interests. In 1876-1915 the exhibits of Museo Kircheriano were moved to other museums which were more suited to house them. (..) We pass into a room containing various ornaments in glass, ivory, and metal, belonging to various nations even of Asia and America. Another room contains ancient Egyptian objects in bronze, terracotta and marble. Finally a second gallery is appropriated to minerals and fossils, some of considerable interest. S. Marta was built in the second half of the XVIIth century as part of an Augustinian nunnery; it was designed by Carlo Fontana. In 1872 it was confiscated and used for several different purposes; niches were replaced by windows and the portal was removed; in the 1960s the portal was reconstructed and the building is now used for small exhibitions. Today the nunnery houses a police station which has jurisdiction over an area which is very critical because it includes Palazzo Chigi, the residence of the Prime Minister, and Palazzo di Montecitorio/Palazzo Madama, the Houses of Parliament. The writer of this page remembers being questioned there after having voiced his views. S. Stefano del Cacco is located on the site of a Temple to Isis and Serapis which was initially built during the second triumvirate; it was surrounded by obelisks and it was decorated with statues; the complex was known as Iseo Campense; the "cat" of Palazzo Grazioli and the statue known as Madama Lucrezia come from this complex, as well as six small obelisks. The reference to Cacco is generally thought to derive from a broken statue of an Egyptian deity which was thought to represent a macaque. Eventually some very fine statues including that of a monkey were found in the area and moved to museums. In 1563 Pope Pius IV assigned S. Stefano del Cacco to the Silvestrini, a branch of the Benedictine order, who greatly modified the church, which had a small porch and an apse decorated with mosaics; the Silvestrini built a monastery on the back of the church. Piè di Marmo (Marble Foot) is the name given to a marble fragment depicting the left foot of a goddess. At Vasi's time it was placed in the street by the same name; in 1878 it was moved to the beginning of the side street leading to S. Stefano del Cacco. A small and somewhat hidden square in the nearby street leading to il Gesù is embellished by the late XVIth century portal of Palazzo Frangipane. 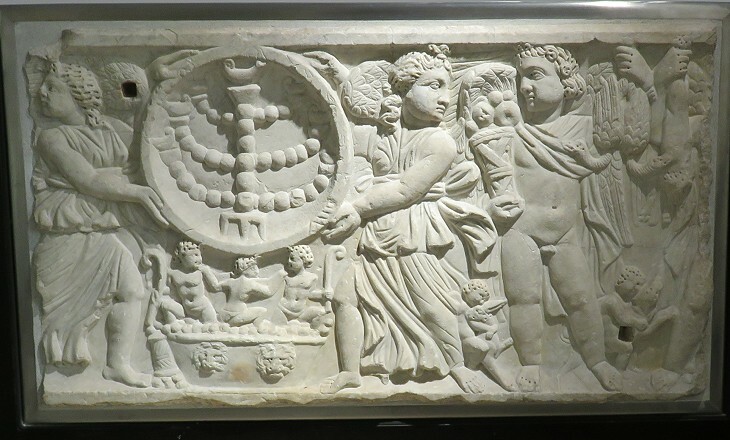 The Frangipane family played an important role in Rome from the XIIth to the XIVth century. They had turned the Colosseo into a fortress, but in the XVIth century their influence and wealth were greatly reduced. 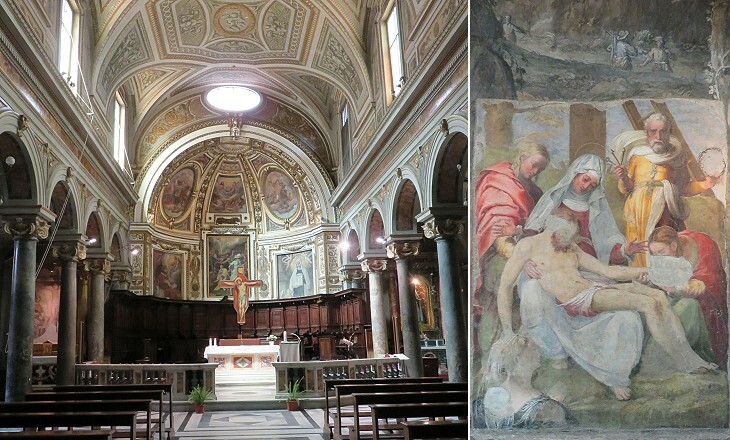 They had their family chapel in nearby S. Marcello al Corso. Next plate in Book 9: Collegio Romano e S. Ignazio. Next step in Day 1 itinerary: Palazzo Panfilio. Next step in Day 4 itinerary: Palazzo Marescotti. Next step in your tour of Rione Pigna: S. Maria in Via Lata. Alla chiesa di s. Ignazio è unito questo magnifico Collegio, eretto col disegno di Bartolommeo Ammannato da Gregorio XIII. per pubblica utilità de' giovani studiosi. Perciò vi si insegna da' PP. Gesuiti la lingua latina, l'ebraica, la greca, e tutte le scienze principiando dall'umanità, rettorica, mattematica, filosofia, e teologia, e però vi concorrono delli studenti, anche di altri collegj. 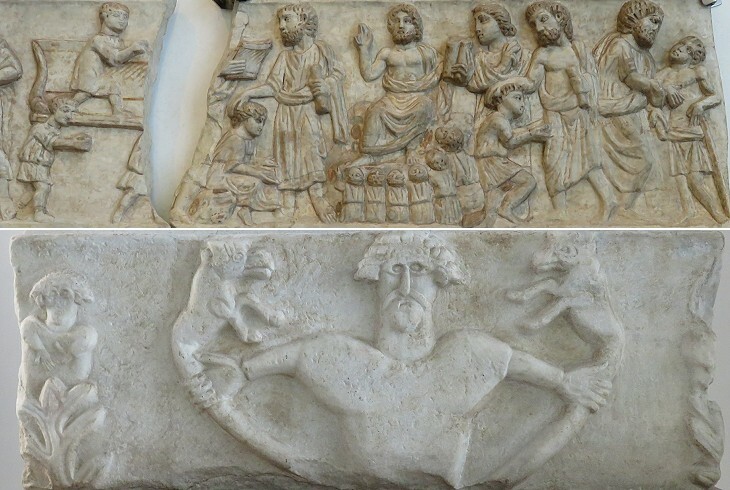 Oltre una copiosa e scelta libreria, evvi ancora un museo di cose antiche, e curiose assai celebre. Da s. Ignazio di Lojola fu eretto il monastero, che incontro al collegio si vede, per collocarvi le povere donne peccatrici, che volevano far penitenza. Ma poi trasportate queste altrove nel 1561 vi furono introdotte delle vergini anche nobili, e furono poste sotto la regola di s. Agostino, e però fu rinnovata, ed ornata la chiesa con marmi, stucchi dorati e pitture. La Trasfigurazione nell' altare a destra è pittura di Alessandro Grimaldi, il s. Francesco Saverio nell'altra di Paolo Albertoni, e il s. Gio. Batista, che siegue di Francesco Cozza, Le tre Marie al sepolcro e quelle di fianco all'altare maggiore sono di Luigi Garzi, l'altro incontro di Fabio Cristofari, e la s. Maria Maddalena, e s. Marta sono di Guglielmo Cortesi. La ss. Vergine nell'altare, che siegue è del Geminiani, l’altra col Bambino e s. Agostino è di Giacomo del Po, il s. Angelo Custode nell'ultimo è di Francesco Rosa, e le pitture nella volta sono del Baciccio. 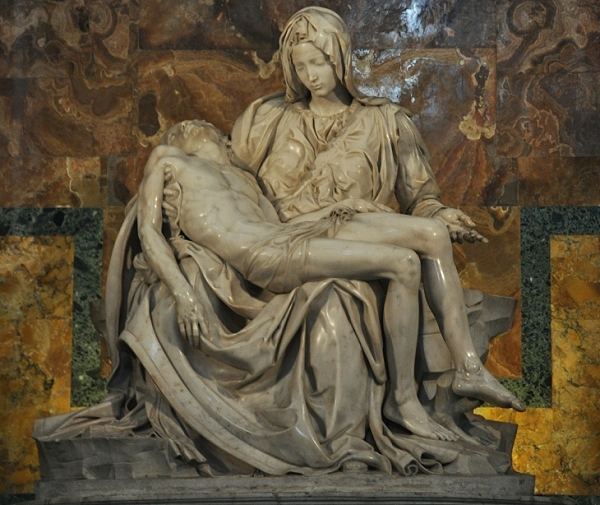 Fu questa eretta sull'antico tempio d' Iside e Serapide, abbruciato da Claudio Imperatore in occasione, che Paolina nobile, e pudica matrona romana, fu ivi offesa da un tale chiamato Mondo, ingannata però da' sacerdoti di quel tempio, i quali le diedero a credere esser amata da Anubi loro Dio: per lo qual misfatto furono tutti fatti morire: ma il tempio fu poi rifatto da Aless. Severo, ed ornato di figure e simboli usati dagli Egizi, de' quali furono i leoni di pietra egizia, che stanno nel fonte dell'acqua felice, e le sfingi a piedi del Campidoglio, con altre quivi trovate. Fu conceduta questa chiesa ai Monaci Silvestrini l'anno 1563. i quali l'hanno riattata, conservandola però nell'antica forma. Il Cristo morto è di Pierin del Vaga, e le pitture a fresco nella tribuna sono del Consolano, ed altre del Baglioni.